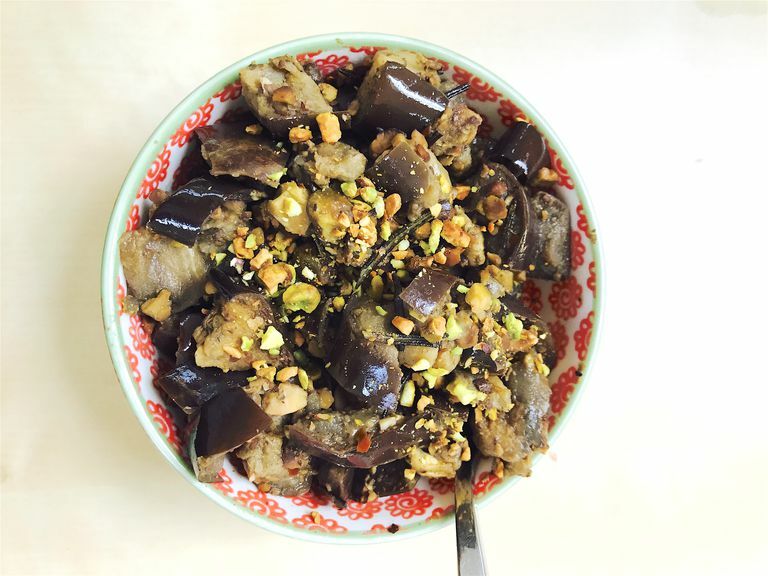 This recipe incorporates brain-healthy ingredients like eggplant, which is low in calories and carbs and a good source of fiber and potassium. Plus, pistachios, which offer vitamin E, are packed with healthy unsaturated fats, protein, and carotenoids lutein and zeaxanthin, which are good for overall cell health. The extra-virgin olive oil adds to the mind-enhancing mix with hundreds of potent antioxidants and anti-inflammatory compounds, as well as healthy fats. Keep in mind that adding the oil after cooking helps maintain its health-enhancing properties, as heating it too high can destroy its delicate plant-based nutrients. Toss all ingredients, except olive oil, into a medium oven-safe bowl. Gently mix together until combined. Place into the oven and cook for 45 minutes to 1 hour. Check and stir every 20 minutes. Once eggplant is soft and browned, remove from oven and let sit for 5 minutes. Drizzle with oil and toss gently to coat. Instead of smoked paprika, you can use curry powder, sriracha, or cayenne pepper. Each spice offers a bold flavor in it’s own way, as well as powerful anti-inflammatory properties. Plus, the capsaicin—the plant compound that gives sriracha and cayenne powder their heat—may boost metabolism slightly. You can also add fresh garlic to boost vitamin C, an important antioxidant, as well as increase the absorption of vitamin B1 or thiamin, which keeps circulation and the heart healthy. Shallots can also add bolder flavor, plus it’s a super star for nutritional value. These small, purplish onions contain quercetin, a compound that may prevent heart disease, type 2 diabetes, and some cancers. Serve warm with a dollop of plain yogurt to cut the heat a bit. Serve alongside grilled salmon or chicken breast, plus a mixed greens salad. You can wrap and save the remaining eggplant in the refrigerator overnight. The flavors meld together well when refrigerated. All you have to do is reheat in the microwave for 30 seconds or in the oven for 10 minutes at 350 degrees to enjoy the dish again.